Pool House for Rent, house for rent in Phuket, centrally situated in Phuket Town, the business centre and nestled in a peaceful community suitable for absolute relaxation and serene escape from the bustle. Within an easy reach to major destinations of Phuket, shopping and dining choices, international school and hospital, fabulous beaches, golf courses, marinas and Phuket international airport are what you are offered by the Tropical Island Paradise. Pool House for Rent is composed of 3 two storey modern style houses featuring 2 types; 2 bedrooms with 2 bathrooms 1 toilet and 3 bedrooms with 3 bathrooms 1 toilet, a fitted kitchen, a luxurious dining room and a stylish living room fully furnished with modern and quality furniture. Pool House for Rent is perfect for those who prefer simple lifestyle amid privacy and seclusion. 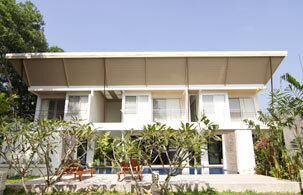 These rental houses in Phuket are also dedicated to providing you comfort, luxury and harmony. The houses are ready to move in at the affordable monthly rental rate.